In Part 1, I wrote on the origin of the "rinse your cottage cheese" factor as described by Jim Collins in his book Good to Great. In this post, I will investigate the application of this principle of self-discipline for everyday life. Galatians 5:22-23 states, "But the fruit of the Spirit is love, joy, peace, patience, kindness, goodness, faithfulness, gentleness and self-control. Against such things there is no law." Personal worship and spiritual growth. Discipline is necessary if we're going to grow in our relationship with Christ. Commitment to the study of God's Word and prayer each day. Active fellowship and involvement in a local church. Regular giving of our time, talent, and money. We must be disciplined and structured if these activities are going to occur on an ongoing basis. These activities are referred to as the Christian disciplines for a reason. Relationships with others. Just as a strong relationship with God doesn't happen without self-discipline, so to our relationships with others cannot be deep and meaningful without purposeful discipline. Time with spouses, children, friends, business relationships, mentors, and mentees must be scheduled, planned, and organized. If we don't plan the time, it's not going to happen. Mission. Fulfilling God's mission for our lives won't happen by accident, either. With God's direction, plus study, preparation, and action, we should pursue a plan that falls in line with His will for our lives. Finances. Our personal finances will be a complete mess if we don't employ priorities, structure, and planning to the money God has blessed us with. We must have some type of "reserve" or emergency fund so that we don't rely on debt to help us in difficult times. We should strive to be debt free. We should have a monthly cashflow (budget) plan in place. We should put systems in place to pay our bills on time, and so on. Organized. Disciplined people are generally well-ordered and tidy with their offices and homes. This is not to say that everything is white-glove clean all the time. A certain amount of mess is inevitable, especially if you have children and a busy schedule! In general though, you should be organized enough so that you know where your wallet, keys, phone, cash, files, and important documents are, so that when you need them, you can find them. Planners. As a general rule, disciplined people plan ahead. They don't forget things. They arrive to appointments on time. They pay their bills on time. They keep a schedule or calendar. They write things down so that they won't forget. Achievers. Disciplined people can develop a plan, execute that plan, and accomplish that plan in a timely manner. They don't procrastinate and wait until the last minute to tackle a project. They pace themselves over time in order to meet goals with a deadline. They do what they say they will do. They follow through on their commitments to themselves and to others. Balanced. Disciplined people understand that life-balance is important. They aren't consumed with their work to the point that they neglect themselves, their families, or other important relationships. They also understand the need for regular rest, recreation, exercise, proper nutrition, and so on. They prioritize. Disciplined Christians understand that they must prioritize their lives. They know that their relationship with God must come first, followed by their family and friends, then their calling in life. When they have a large project in front of them, they understand how to break down the various project tasks and employ a prioritized order to those tasks. Singleness of mind. People with singleness of mind have a vision, a purpose to their life. They don't jump from one goal to another. They finish what they start. They do unpleasant tasks even when they don't really want to do them. They have the end goal in mind and are able to bend all their will to accomplish the goal. overcome the habit of watching too much TV or any other activity that we use to avoid taking action. take action when all you want to do is to lie down or sit and watch TV. learn to wake up and get up early. Anything worthwhile in life requires self-discipline. 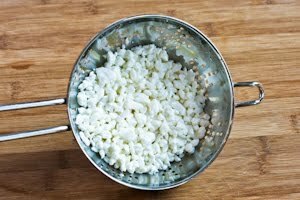 Are you rinsing your cottage cheese, today?